A large part of the imposing and magnificent St. Magnus Cathedral in Kirkwall has stood for over 850 years. 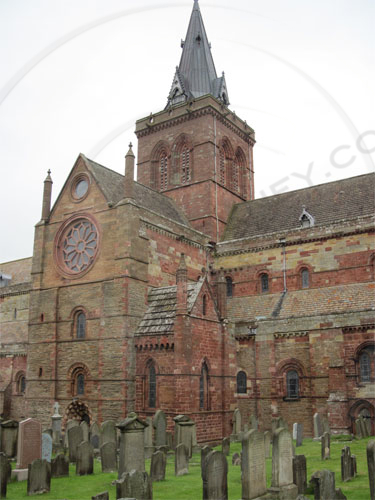 In 1137, work started on this church built of red and yellow sandstone, to house the bones (relics) of St. Magnus. Northern side view featuring the Rose window. St. Magnus is the patron saint of Orkney and a 12th century Norwegian ruler of the islands. Earl Magnus Erland ruled alongside his cousin Earl Haakon but the two had many differences. Around 1117, the two earls were brought together by their followers, in an attempt at reconciliation but the warmongering Earl Haakon had no intention of a peaceful meeting and brought with him eight ships and an army of men. The popular and peace loving Earl Magnus attempted to settle things amicably but Haakon’s advisers insisted that Magnus must die. The grim task fell upon Haakon’s cook, Lifolf, who killed Magnus with his axe. The body was then buried at Christ’s Church in Birsay. Stories of miraculous cures began to be associated with Earl Magnus’ burial place. Public opinion became so strong that the Bishop of Orkney declared Magnus a saint and the day of his death, 16th April, became the day of his martyrdom. In 1129 Kali Kolson, the nephew of Earl Magnus came to Orkney and defeated Haakon’s ruling son. Kali became Earl of Orkney and took the name Rognvald in memory of a previous Earl. Rognvald vowed he would build a church of stone dedicated to his uncle and to it “be brought his relics and with them the Episcopal seat”. 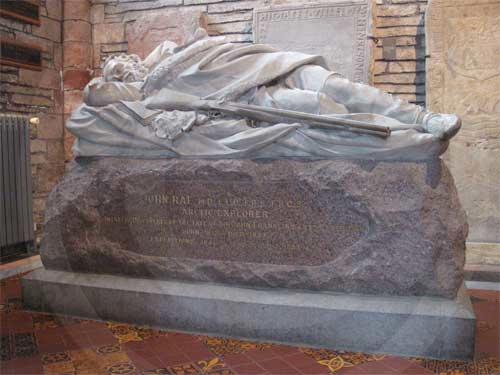 Upon his death, Rognvald was laid to rest in the magnificent church which he had founded, and thirty years after his death was also declared a saint. The remains of St. Magus and St. Rognvald remain within the cathedral. The strong walls of St Magnus Cathedral are constructed of red and yellow sandstone, giving a warmth and softness to the magnificent structure. Impressive Romanesque style blind arches, run along the full length of the nave of the cathedral. It is suggested that these were not only ornamental but helped to reduce the weight of the walls. Detailing in the stonework is breathtaking but not ostentatious. For a large building constructed of stone, it has a feeling of homely warmth and a certainty that one is safe within it’s walls. Many tombstones lifted from the floor, now stand against the walls of the nave isles, the majority from the 17th century. An arched recess in the south wall is believed to belong to the native Orkney Paplay family and is thought to date back to the 14th century. 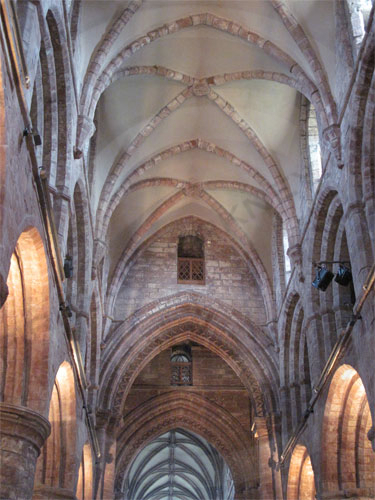 St. Magnus cathedral is the only cathedral in the British Isles with a dungeon. Located between the south wall of the choir and south transept chapel, it is known as Marwick’s Hole and records tell of imprisoned men and women as late as the 18th century. A Knights Templar cross can also be seen carved into one of the stones in the south transept. Throughout the cathedral is a wealth of intricate wooden carvings. None more so than the choir area and the decorative organ screen designed by George Mackie Watson. During restoration works in 1919, some of the stones in the choir’s south arcade were found to be loose. In a cavity behind these stones was found a casket containing the relics of St. Magnus. The casket now resides in Orkney Museum but the bones were restored to their original resting place. 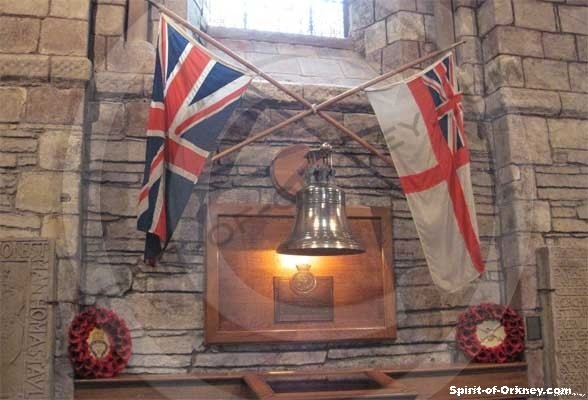 In the north choir isle, is a memorial to the 833 drowned men of HMS Royal Oak, which was torpedoed in Scapa Flow by a German U-Boat in 1939. The ship’s bell which was recovered from the wreck by dievrs int he 1970’s, hangs over a wooden plaque and glass topped case. The glass case contains a book listing the names of those who perished at sea. A regular weekly job of the cathedral wardens is to turn a single pages of the book of remembrance. The east end of the choir, part of which dates from the 13th century was dedicated St Rognvald chapel in 1965. New furnishings were commissioned which incorporate 16th and 17th century carved panels which had been held for preservation in the cathedral. 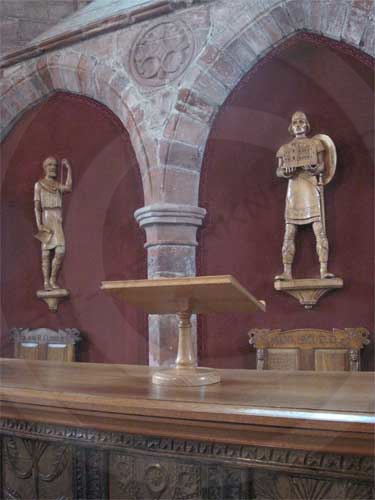 Designed by Orcadian Dr Stanley Cursiter, the Queen’s limner and Painter in Scotland and made by local carpenter Reynold Eunson, the communion table and prayer desk are inlaid with the 16th and 17th century panels with three figures of Kol, St. Rognvald and Bishop William the Old standing above in three arches. To the right of the St. Rognvald Chapel is a life size monument to Dr. John Rae, the famous Orcadian Arctic explorer who surveyed parts of the North West Passage and discovered the fated Franklin expedition. Orkneyinga Saga – Discover more about the Norse Earldom of Orkney. The Society of Friends of St. Magnus Cathedral.